Posted April 14th, 2013 - News Posted for ISA News. 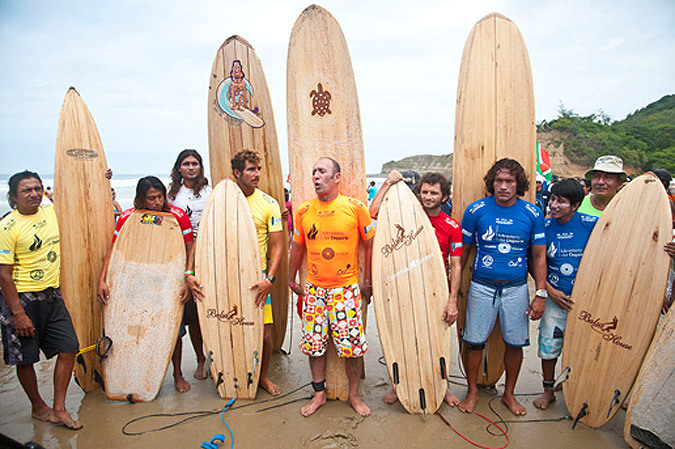 The 2013 ISA World Masters Surfing Championship confirmed all finalists on Saturday. Day 7 of the competition featured all the Repechage Finals that determined the last two athletes who would make it into the Grand Final. Day 7 also featured a Balsa Surfboard Demonstration and the ISA Aloha Cup, a tag-team relay competition featuring the top 8 finishing teams from last year’s ISA World Masters, each with squads made up of 4 men and 1 women. The first competitors confirmed for Sunday’s Finals were the Grand Kahunas. Three-time ISA World Masters Champion and 2012 Silver Medalist, Grand Kahuna Chris Knutsen from South Africa is looking to return to the podium for Gold. Knutsen scored 12.90 in the Repechage Final, overcoming France’s Eric Graciet (12.23), who will be joining Knutsen in the Final, sending Charlie O’Sullivan (AUS, 11.90) and Jose De Tramontana (PER, 8.90) home. Already in the Grand Kahunas Final, having come through the Qualifying round on Friday, are Allen Sarlo (USA) and Craig Schieber (CRC). The Women’s Masters Final is now complete with the addition of Andrea Lopes (BRA, 14.10), and 2-time ISA World Champion, Heather Clark (ZAF, 11.00), who finished second. This was the end of the competition for Maria Celia Barboza (URU, 7.94) and Siri Cota (USA, 7,73). Already in the Women’s Final, having come through the Qualifying round on Friday are Layne Beachley (AUS) and Rochelle Ballard (HAW). The Grand Masters had a big upset with the elimination of 4-time ISA World Champion Juan Ashton (PRC, 10.17), who placed third behind Dean Randazzo (USA, 14.40), and Marcelo Alves (BRA, 12.60). Also eliminated was Rick Takahashi (USA, 10.04), who came in fourth. This is the first time Randazzo has reached an ISA Final, after placing 5th in the overall individual standings of the division in 2010 and 2011. Already in the Grand Masters Final, having come through the Qualifying round are Hawaiians Sunny Garcia and Love Hodel. Last year’s Masters Champion, Magnum Martinez put himself in position to defend his Gold Medal. Martinez was the best surfer of the day posting the highest total heat score of 17.66, defeating Kalani Robb (HAW, 11.50), who will be joining him in the Final, and sending home Martin Passeri (ARG, 11.10) and Matt Clark (AUS, 9.20). The Masters Finals is going to be stacked as Martinez and Robb join Sunny Garcia (HAW), and Greg Emslie (ZAF). In the Kahunas, Mike Latronic (HAW) has again reached an ISA Final. The stylish Hawaiian is now searching to improve upon last year’s Bronze Medal. With a 14.54, Latronic defeated South African Andre Malherbe (12.37), who is in the Final for the second time during his Masters career. Glen Valaire (AUS, 12.04) and Reuben Balmores (HAW, 11.47) were sent home after placing 3rd and 4th, respectively. Jojo De Olivenca (BRA) and Ricky Schaffer (USA) will be the other two surfers who advanced to the Final through the Qualifying round. The Semifinals of the ISA Aloha Cup took place today. Heat 1 featured Hawaii, Venezuela, Peru and Ecuador. With good strategy, speed, and execution, Team Hawaii won with Venezuela in second, Ecuador in third, and Peru in fourth. In Heat 2, Team Australia defeated Brazil, finishing in second, USA in third and Puerto Rico in fourth. The Final of the Aloha Cup takes place Sunday with the two top performing teams from each heat: Hawaii, Venezuela, Australia and Brazil. Ecuador is the Balsa Wood Capital of the World in surfing. Surfboard shapers around the world have been making boards from Ecuadorean Balsa since 1940. The early boards sell for tens of thousands of dollars on the surf memorabilia market today. The local surf shop in Montañita that specializes in Balsa surfboards, “Balsa House,” hosted the Balsa Surfboard Demonstration. This special event featured seven local surfers and ISA President Fernando Aguerre riding waves. The demonstration illustrated the high performance capabilities of Balsa Wood surfboards. Local Emilio Chong and Cesar “Rasty” Moreira, who both surfed in the demonstration, also organized the “Expo Balsa Surf,” a beautiful exhibit, which showcases the work of many Ecuadorean Balsa Wood shapers. The Expo is open to the public during the ISA World Masters. The Expo has developed a message of sustainability and reducing the carbon footprint produced by the surfing community, in support of the “Rise Against Plastics” campaign. All the boards featured were made from sustainable balsa grown on Ecuadorean farms to help preserve the environment. The 2013 ISA World Masters Surfing Championship concludes on Sunday when the Team Champion and winner of the Eduardo Arena Perpetual Trophy along with all the individual Gold Medalists will be determined. Surf conditions are expected to be epic tomorrow with 5-8 feet sets with occasional larger sets in the 10 foot range according to Surfline, the official forecaster of the event. Competition resumes at 7:40am (local time) with The Morning Show hosted by Mark Fewell featuring Kahunas finalists Mike Latronic (HAW) and Jojo de Olivenca (BRA), which will be broadcast live on the internet at www.isawmsc.com.